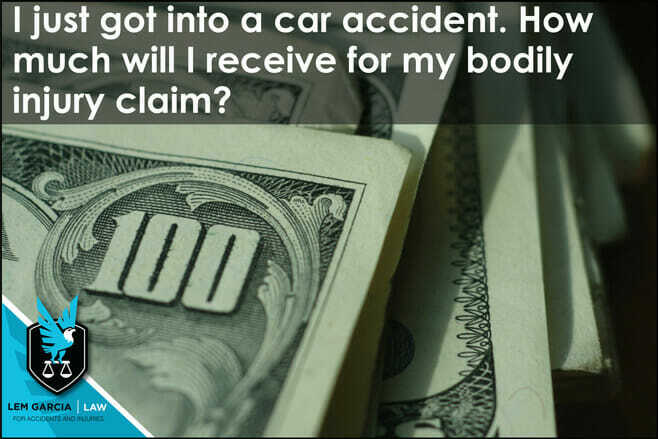 If you’re trying to find out how much your car accident bodily injury claim is worth immediately after a crash, you might be able to find an attorney or an online calculator to provide you with an answer. However, the answer you receive will probably be misleading. It is impossible to tell you how much you will receive for your bodily injury claim immediately after a crash or soon afterwards. There are too many variables to consider for someone to competently put a number on how much you will receive for your bodily injury claim. In every car accident case, the three main issues are liability, damages, and insurance coverage. At the beginning of your case, you do not know how much medical treatment you will receive or how much you need to receive. You also do not know how much insurance coverage the other party has or if you have insurance coverage of your own that you could recover from. Furthermore, you don’t know if the other party’s insurance carrier or even your own insurance carrier will agree to pay you what your case is potentially worth. In the event that the insurance company refuses to pay what your bodily injury claim is worth, you may have to file a lawsuit to pursue what you believe your case is worth. In this situation, the costs of your case would increase, which would end up coming out of the recovery you receive in your case, whether by settlement or by trial. These are not the only variables to consider at the beginning of your case. There are others as well, which exceed the scope addressed here. Ultimately, if an attorney or an online calculator tells you how much you will receive after a car accident, you should seek the opinion of another experienced personal injury lawyer and find out if you get the same answer. The attorney or online calculator that provides you with a settlement amount might just be trying to tell you what you want to hear so that you will retain their services. At Lem Garcia Law, we aim to provide top notch legal services to all of our clients and give them straightforward and truthful information so that you can make an informed decision on how to proceed. We understand that your case means a lot to you, and we want to make sure that you make the best decision possible for you and your family. West Covina car accident attorney, Lem Garcia, provides free case consultations to people who have been injured in a car accident. There is no obligation. We strive to help as many people as possible to prevent anyone getting taken advantage by the insurance company.